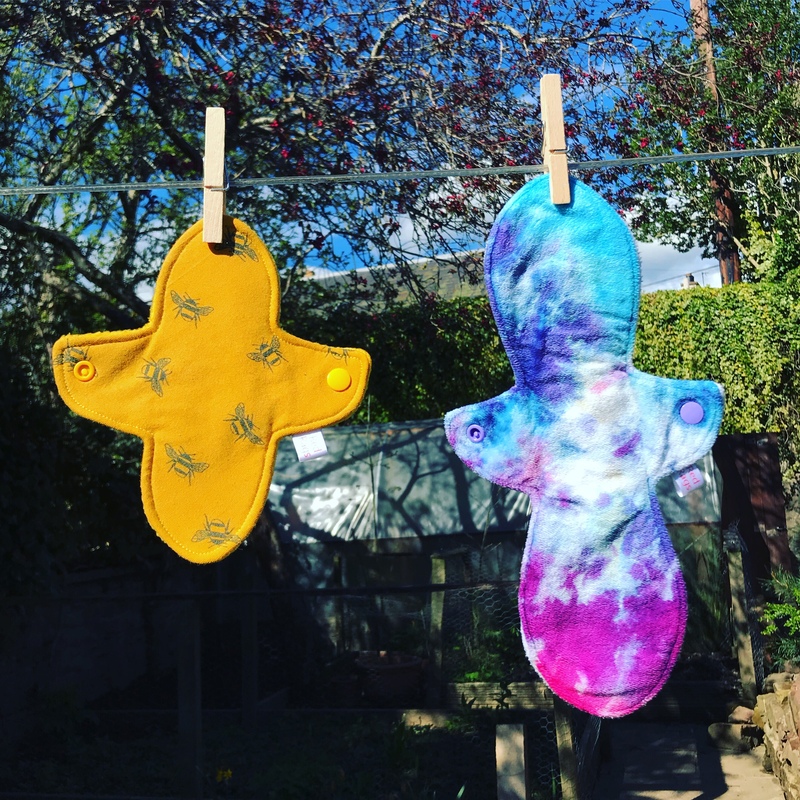 Another cheeky mama fluff post to try and tempt you to embrace the softer more enjoyable side of your periods! The lovely Abbie at Red Rags Cloth Pads asked me if I was interested in trying her new shape of reusable sanitary pad. I jumped at the chance (as you do!) because frankly I rather enjoy having a pretty period! My two pads arrived quickly and well packaged. I opted for a regular liner and an extra heavy bamboo velour topped one. My surprise prints didn’t disappoint and I got lovely yellow mustard bee print and a funky stormy blue purple mix! The new shaped wings are actually a stroke of genius. They are genuinely well thought out. The way the curve of the wings sit means they fit really nicely around your underwear. This little pad is extremely handy! It’s a fab wee shape and sits in place nicely. I used this at the end of my period. The delightfully awkward phase where my body still hasn’t quite decided if it’s finished or not. There was no movement once I’d snapped it in place and I was barely aware I was even wearing the liner most of the time it was on! It coped well with the aftermath of my flow and washed beautifully. When my next period was due to come around I had a feeling I was going to come on whilst I was out for the morning so I popped this on just in case. I was really glad I did and it kept me leak free until I was able to change it for a more absorbent pad! Thank goodness! Possibly a tad too much information but my first day and night of my menstrual cycle tend to be a bit extreme! This extra heavy pad got stuck straight in and stood up to some thorough testing! No leaks at all and there was no irritation from the super comfy topping. I wasn’t too warm down there either, which was a bonus! I managed to get this pad washed and dried within a few hours, which was amazing and it meant I got to try it out overnight too. No issues whatsoever overnight. Despite it’s length, the pad stayed in place and kept me secure and leak free all night. I was very impressed. There are loads of size options available so you really can tailor them to suit you. There are light, regular, heavy, extra heavy and postpartum options available. These all come in a variety of lengths from 5 inches all the way up to 16 inches. You can also get the width custom sized too! You can find Red Rags CSP here. They’re on Instagram and Facebook too if you fancy some pretty fluff in your feeds. There is also a Facebook group called Red Rags Exclusives where you can get first dibs on pretty new prints, friendly chat and advice. Right, I’m off for a nose at their current fabric stash for some more…! Next Which Reusable Swim Nappy? Periods have never been so pretty! I’m going to put together a wee box each for the girls, all ready for their first period. A wee selection of cloth pads and liners will go in, along with some other pretty bits and pieces. I can Highly recommend them!